Adorable Baby Girls 1st Birthday Blue Baby Fish!Hand cut and sewn at the waist. Set includes tutu,onesie or shirt and shell bow on a headband! Tutu will be made with beautiful aqua and blue colors plus it has blue sparkly tulle and many beautiful aqua blue ribbon strands around it. Bow is hand cut and sewn to perfection features several creme color pearls in the middle of it. Can be placed on a headband or clip. Additional bows available upon request at an additional cost. 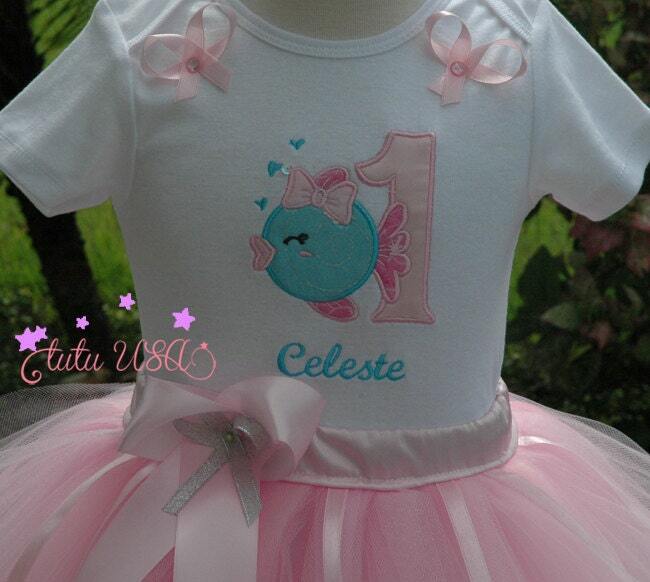 Onesie will be embroidered with the number 1 or other birthday year if you prefer. And will be personalized with your baby's name!